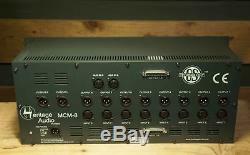 Heritage Audio HAMCM8 8 Slot Rack with Mixer on Slot Technology Mcm. Standing for Music Compact Mixer 8, the MCM-8 is an 8 slot 500 Series enclosure with 10 channel mixing capabilities and it´s the Top of the Line of the new Heritage Audio "ON SLOT" Technology (OTS) 500 Series enclosures. "ON SLOT TECHNOLOGY" takes advantage of last generation power electronics to handle power supply on a "per slot" basis. Each slot has its own power supply linear regulation stages; therefore modules are isolated from the rest. They just share the metal enclosure. Each slot features test LEDs for checking correct power operation (red for +16v, green for -16v), located aside of the slot connector. Thanks to the use of OST, the power capability of the MCM-8 is 400mA per rail per slot maximum, with an overall of 1.4A (1.6A non continuous) per rail, whichever is reached first. Phantom power available is 140mA total. The RAF Blue Gray enclosure is made out of heavy gauge steel with an aluminum front panel. There are Pan and Fader controls per slot on dual concentric potentiometers. Pan pots are center detent for precise center positioning. Features include an ON switch to assign each channel to the Mix Bus. The Mix Bus follows a passive, voltage summing topology, similar to that found in the 80 Series consoles of the 70s. The gain loss is restored by the same Class A, 2n3055 driven, transformer based output stage used in the Heritage Audio 1073. An additional Stereo Input is provided on the back of the unit, allowing several MCM-8 units to be daisy chained, or signals not needing further 500 series processing to be mixed together. The central section has analog VU meters and a Stereo Master fader. Connections are made by means of both gold plated XLRs and DSUB25 Input and Outputs, with Standard Tascam protocol. Merchandise and packaging MUST be in the same condition as when received. Alto Music reserves the right to refuse any return if it appears the item has been used. Software (if unsealed or registered). Harmonicas, Mouthpieces, Earbuds/Earphones/Headphones(if unsealed), or any item that may come in contact with the mouth, ears or nose. We will consider your offer as soon as it is received. We will then either accept, decline, or counter accordingly. Please do not send a message or call Alto Music in regards to best offers. If a specific listing of ours does not include the "make an offer" button, we are then currently not accepting anything less than the BIN price for that particular item. The item "Heritage Audio HAMCM8 8 Slot Rack with Mixer on Slot Technology Mcm" is in sale since Friday, October 26, 2018. This item is in the category "Musical Instruments & Gear\Pro Audio Equipment\Cases, Racks & Bags". The seller is "altomusic" and is located in Middletown, New York. This item can be shipped to United States.